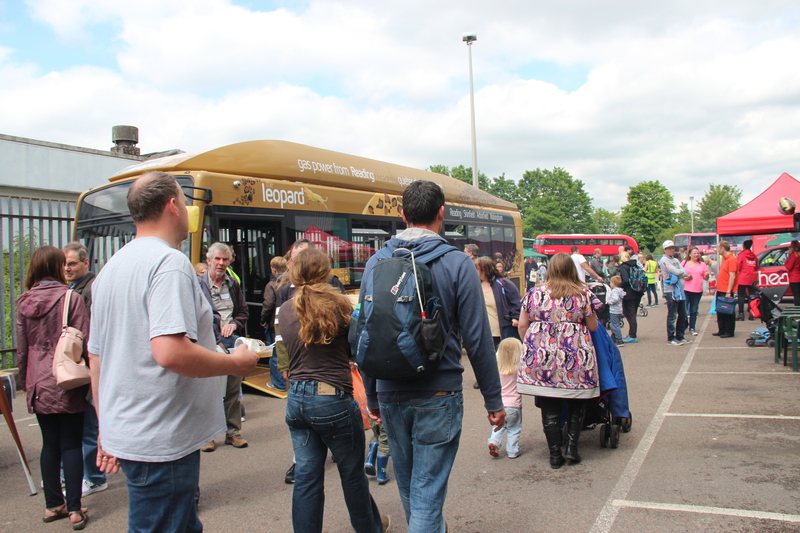 “OUR BUS”: Reading Buses Open Day 2015. 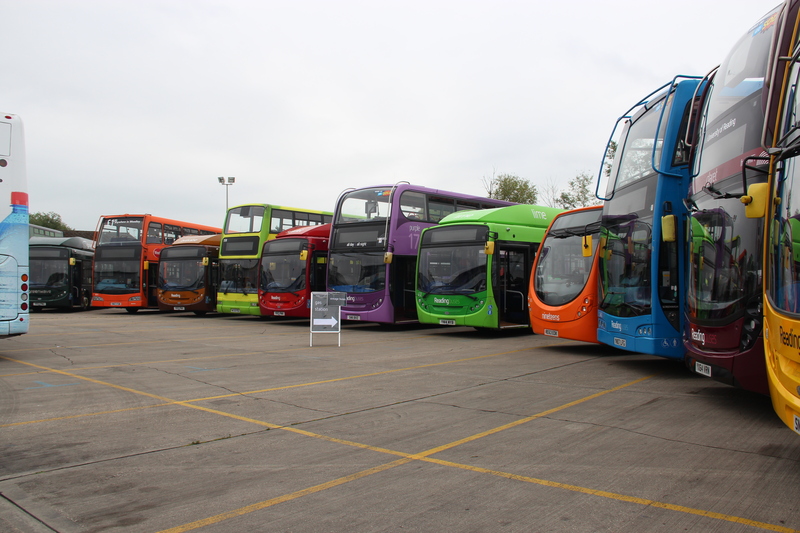 Part of Reading’s ‘Rainbow of Buses’. Let’s face it. Most of us have a bus at some point in our lives. The bus that took you to school, work, into town during the day for the shops or to the cinema in the evening and we all remember the number. Mine was the 476, taking me from our neighbourhood into Crawley town centre. My Dad’s bus (in my young eyes at least) was the 405B because that took him to work and back each day. Long after some of you have ditched the bus for the car and long after the route number has changed, the bus that took you to all of these places will still be ‘your bus’. In Reading the travelling public hold great affection for ‘their bus’. It’s not just the number they remember, it’s the colour as well. 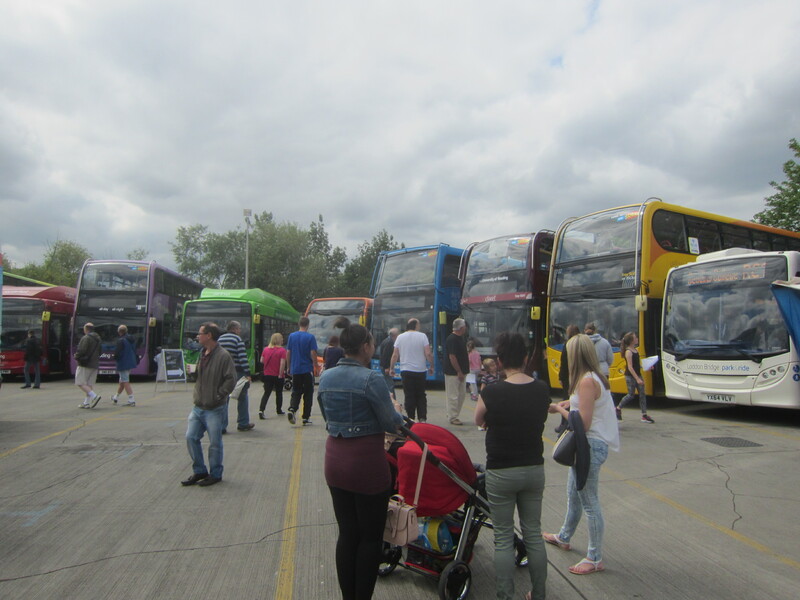 They also turn up every year when Reading Buses open their depot to the public for their Family Fun Day to pay homage to their bus. They get the chance to get close to it, sit in the driving seat, see it being washed, groomed and re-fuelled. 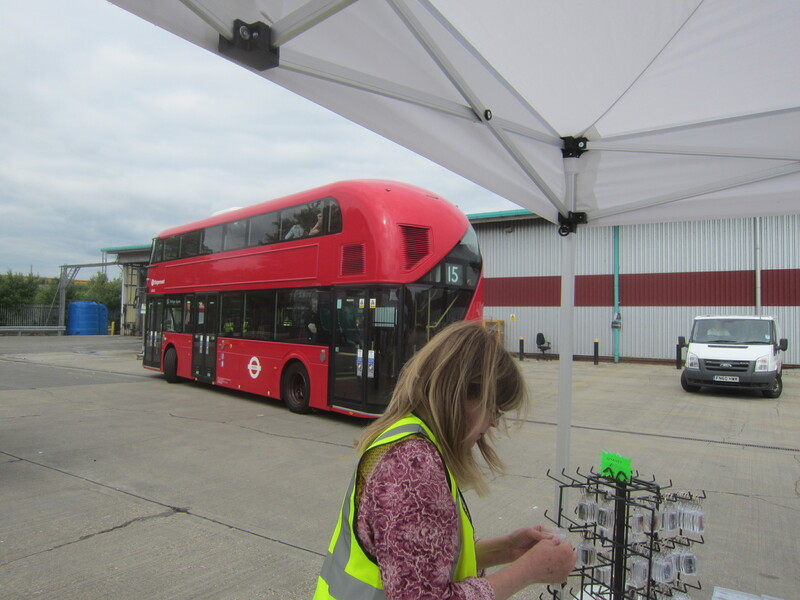 They also take their bus home with them in one of our products, sometimes even as a gift buying ‘Grandad’s bus’ or ‘their friend’s bus’. The crowds pass ‘The Leopard’ as they make their way into the depot. But there’s always something new to look for at Reading. 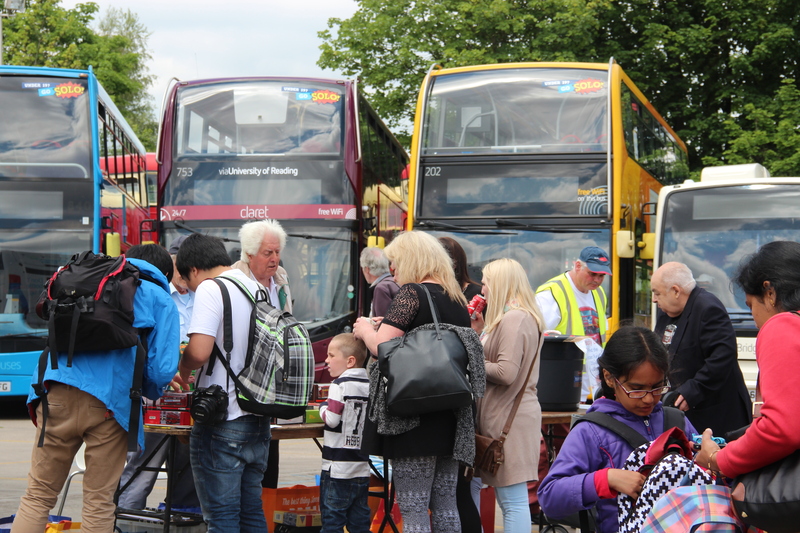 Last year’s star attraction was ‘The Leopard’, a fleet of buses accordingly decorated to work a route with the same branding. 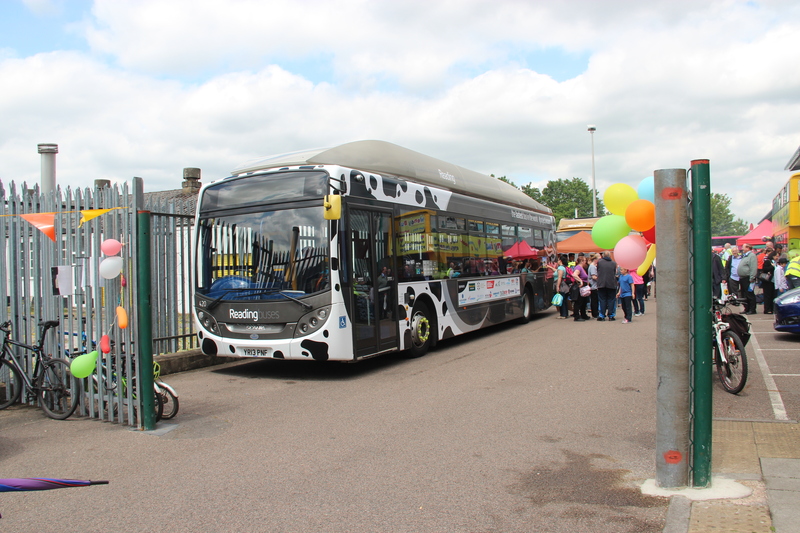 This year it was ‘The Cow Bus’, a vehicle powered by methane and one which set a speed record of 80.78 mph, the fastest ever for a gas powered bus. ‘The Cow Bus’ (aka ‘The Bus Hound’) stands by the gates. For 60p you could sit in the drivers seat of the world’s fastest gas bus. 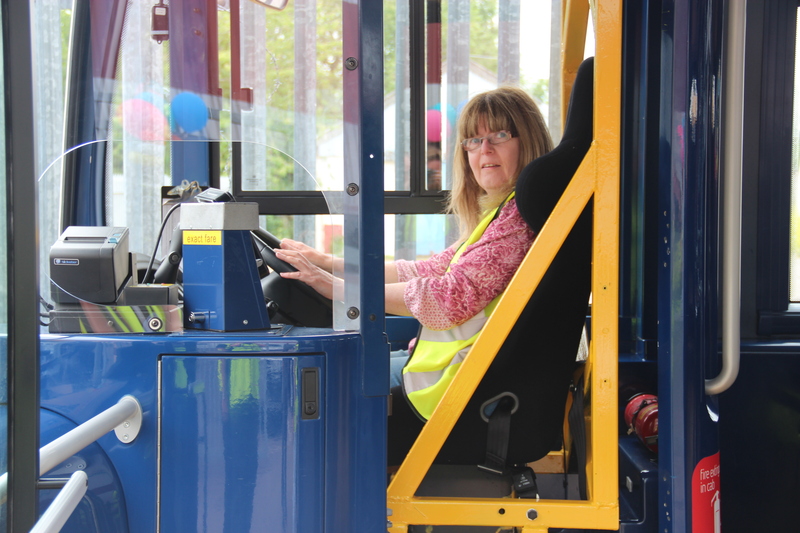 Guess who paid her 60p and had a go….. ? I wrote here last year about how the people of Reading love their buses. I’m pleased to say that they still do, and will for a long time. 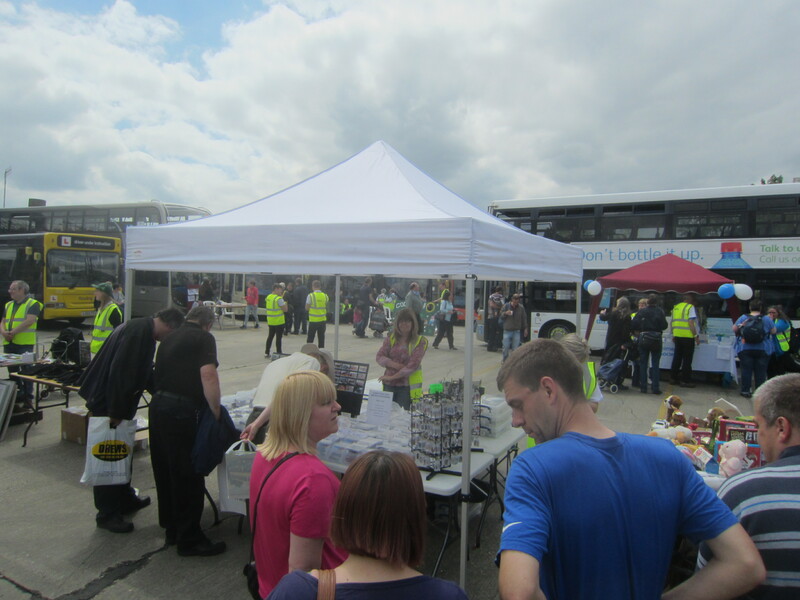 The proceeds from the event went to the Alzheimer’s Society, Reading Buses charity for 2015. 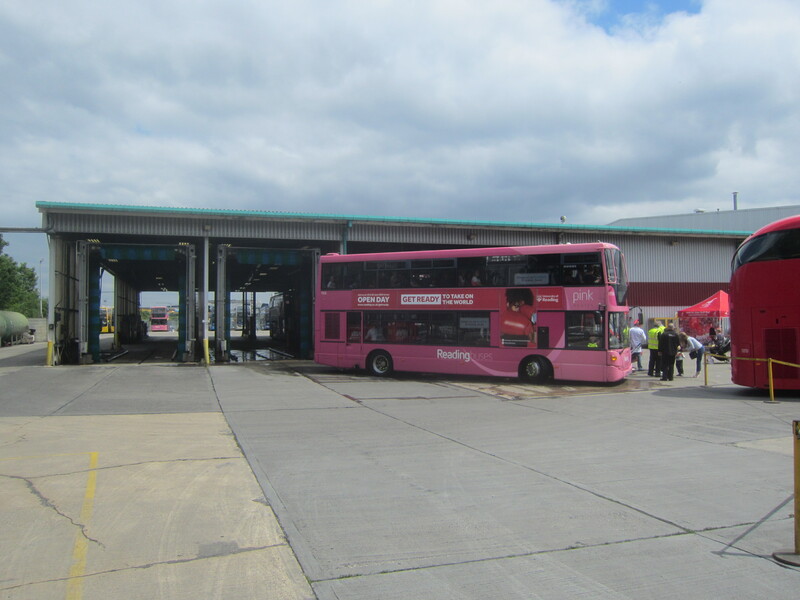 Thank you and congratulations to everyone at Reading Buses for a very enjoyable day. Geoff Nash. Visitors gather around one of the many sales stalls. The Junction Ten gazebo with Gina in charge. Possibly the cleanest bus in Reading’s fleet, giving rides through the bus wash.
A visitor from London calls at the Junction Ten gazebo at the end of the day. ← CLACTON BUS RALLY 2015: RAIN WON’T STOP PLAY.